Photo of St. Patrick's First Communion in 1946. 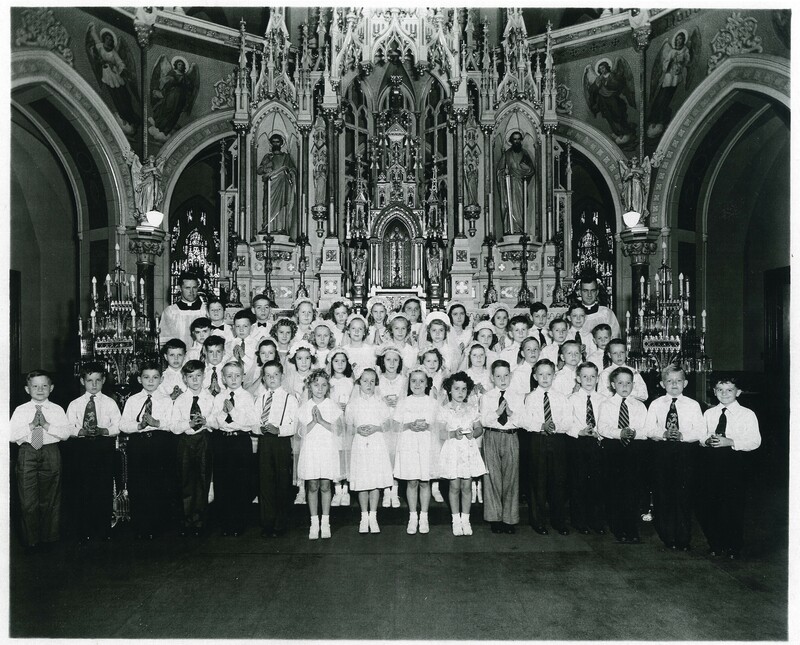 Photograph of St. Patrick's First Communion Class on June 9, 1946. There were 48 members that took their first communion. Front Row: Buddy Busch, Paul Higar, _____, Omer Bussen, Daniel Lamb, ______, ______, ______, Judy Peters, Joan Funk, David Ernst, ______, Jim Walker, ______, _______, _______. Second Row: _______, Tom Madell, the rest are unknown. Third Row: Gary Burnett, the rest are unknown. Fourth Row: Father O'Shaunassy, _______, Larry Lavery, the rest are unknown, back right Father Ettlebrick. Buddy Busch, Paul Higar, Omer Bussen, Daniel Lamb, Judy Peters, Joan Funk, David Ernst, Jim Walker, Tom Madell, Gary Burnett, Father O'Shaunassy, Larry Lavery, Father Ettlebrick. Churches, Roman Catholic, St. Patrick's Church, Photo File: Churches, Decatur, IL. 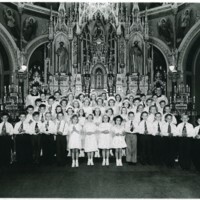 unknown, “Photo of St. Patrick's First Communion in 1946.,” Decatur Illinois Public Library Local History Photo Collection, accessed April 26, 2019, http://omeka.decaturlibrary.org/items/show/2910.